Despite a magnificent spell from Pat Cummins, which reduced India to 44-5 at the end of Day 3, India were in a comfortable position thanks to their first innings lead of 292 runs. On Day 4, India declared the second innings at 106-8 thereby setting Australia a huge target of 399. Jasprit Bumrah, who destroyed Australia with his 6-33 in the first innings, was at his best again in the final innings of the match as he picked the wicket of Aaron Finch in his very first over. 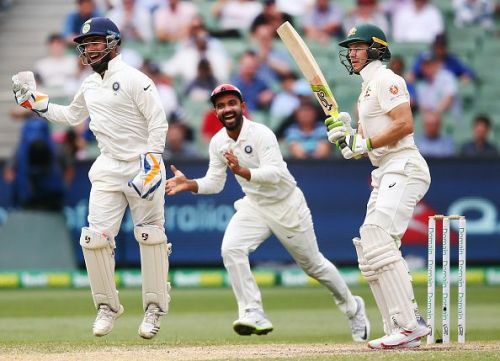 After Finch's dismissal, Marcus Harris and Usman Khawaja tried to build a partnership but the former fell victim to Ravindra Jadeja, thanks to a sharp catch by Mayank Agarwal. Mohammad Shami, who was introduced into the attack after Harris' wicket, bowled brilliantly and was rewarded with the wicket of Khawaja. For the fourth wicket, Shaun Marsh and Travis Head put together 41 runs but the timely breakthrough provided by Bumrah in the form of Marsh' wicket did not allow the partnership to grow. The elder Marsh brother was replaced by the younger one in the middle but even his stay lasted for a short while. After smashing Jadeja for a six off the last ball of the 40th over, Mitchell Marsh tried to repeat the same off the first ball of the Jadeja's next over but handed a simple catch to Virat Kohli. The wicket of Mitchell Marsh brought Tim Paine into the middle. Just like their top order, even the last two recognized batsmen could not do much. Ishant Sharma too joined the party as he sent Travis Head back to the pavilion. Paine's, stay too did not last long as Rishabh Pant managed to take a sharp catch off Jadeja's bowling. Before Paine got out, Pant ensured that the Australian skipper got a taste of his own medicine after the babysitting comment. Talking to Mayank Agarwal, when Paine was on strike, Pant said "We have got a special guest here. Have you heard the word temporary captain ever?" He also advised Jadeja to keep it simple. "You (Jadeja) don't need anything to get him out. Come on lads." The Pant-Paine verbal banter and Pant's sharp catch to dismiss Paine did not go unnoticed and Twitter had a field day thanks to both the wicket-keepers. Gould cannot have a word to Pant, nope. He didn't say anything to Paine. Cannot have different lines for different people. I want to do a talk show with Rishabh Pant and Tim Paine. Bowl spinner from both ends let Pant mock Paine. Pant giving it back to Paine.